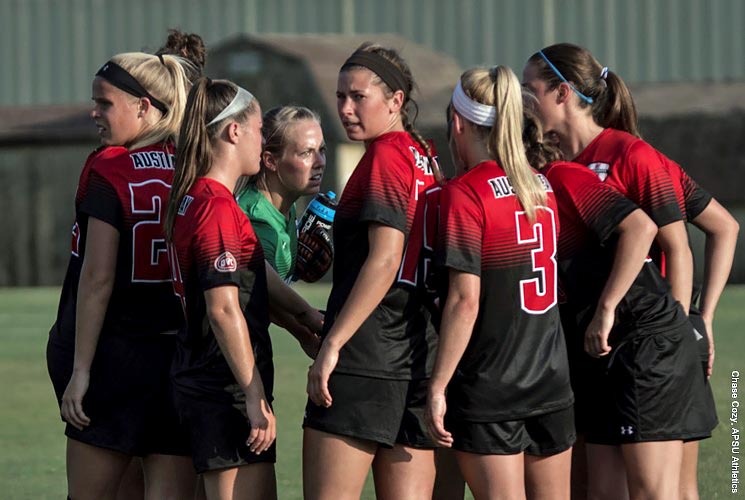 Chattanooga, TN – Kirstin Robertson  and Renee Semaan  each scored in the 2017 season opener, but Austin Peay State University women’s soccer team dropped a 3-2 decision to Chattanooga, Friday night at Finley Stadium. For the second consecutive match, Austin Peay (0-1) fell into an early deficit as Chattanooga’s Jordan Mueller drove home a cross in the fourth minute for an early 1-0 lead. The Mocs threatened to double their lead but Govs goalkeeper Lindsey Todd  turned aside a scoring chance in the 15th minute. The Governors did not lack for opportunities over the next 20 minutes, forcing Chattanooga goalkeeper Melia Correa to make saves on consecutive shots in the 24th and 25th minutes. Another flurry 10 minutes later saw Correa make another stop in the 35th minute. But on the ensuing corner kick McKenzie Dixon  found Renee Semaan ‘s feet and she booted in the game-tying goal. Chattanooga (1-0) wasted no time responding to the tying goal and Mueller again did the honors, driving in a goal off a corner kick by McKenzie Gregg to give the Mocs a 2-1 lead they carried into halftime. A quiet start to the second half was broken by the Mocs in the 58th minute when Mueller found Catherine Meyer who scored the eventual game-winning goal. 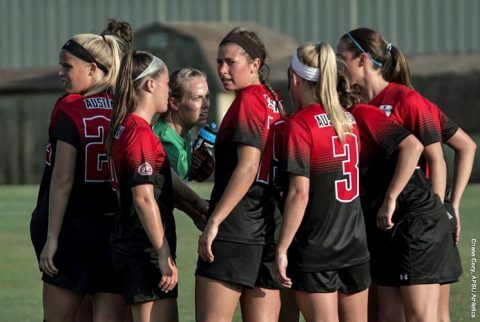 Austin Peay responded quickly with Kirstin Robertson  finding the net in the 65th minute despite three Mocs surrounding her eight yards from goal, narrowing the deficit to 3-2. However, Austin Peay could not find the tying goal in the final 25 minutes. The Govs had four shots in the final stanza, forcing a pair of saves. Robertson nearly tied the game in the 89th minute but the Mocs were able to stop her header shy of the goal line to preserve the win. The Governors finished the game with advantages in both shots (15-5) and corner kicks (7-2), demonstrating their control of the game’s flow. However, Chattanooga’s Correa made seven saves to deny the Govs a positive result. Kirstin Robertson ‘s goal in the 65th minute was her 15th career goal, making her the fifth Austin Peay player to record 15 career goals in the program’s 16 seasons. She now has 37 career points – fifth most in program history. Seamann’s goal in the 35th minute was Austin Peay’s first of 2017. It also was her third career goal and the second time she has scored in the season’s first two weeks. Her first career goal came in last season’s Game 4 at Western Kentucky. Freshman Claire Larose  made plenty of noise in her first collegiate game, posting five shots – three of those on goal. While she didn’t find the back of the net, it was a promising start for the rookie. Austin Peay will get a fresh opportunity to notch their season’s first win with a 6:00pm, Sunday contest at Middle Tennessee.